The Fourth » Look at it this way: Free mug! Look at it this way: Free mug! Apparently Lorelei used her healing magic to remove the wolf that was biting Derk, as well. It’s ok, Frozio. I think you’re magnificent. 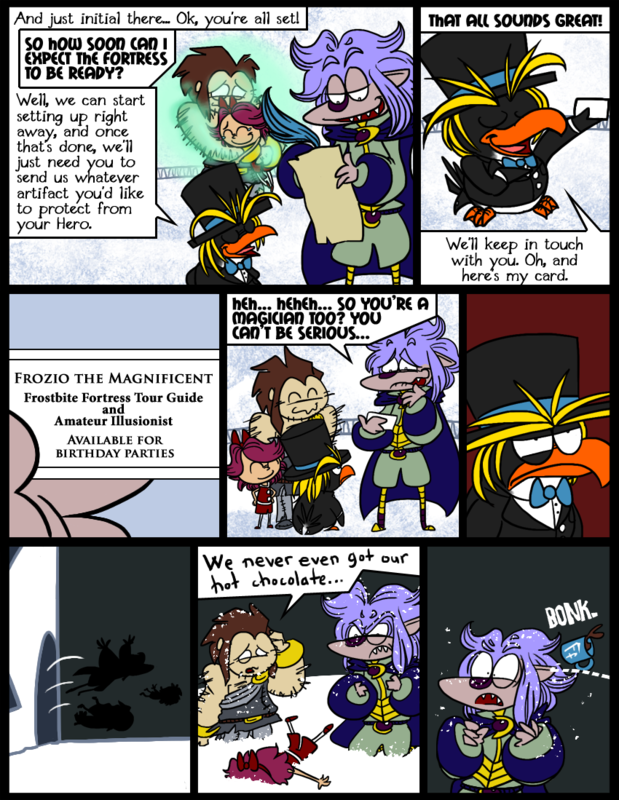 Skärva can make fun all he wants but I totally want a penguin who does magic tricks at my birthday party. Also, it became night! Time for ten comics about them trying to get dinner! That’s one way to leave a dungeon! And that healing hug is heartily heartwarming! Icee what he did there. Poor Skarva. Maybe next time he shouldn’t insult the person with a three headed hydra on his side? He really ought to learn to think before he speaks. You’d think after the short jokes disaster he’d be wary. Do i get a cookie because I was right? Besides, he’s got a bowtie! Bowties are cool! Huh. Was that a TF2 reference toward the end? XD Probably not, but still. Oops, sorry about that. You were only half right, getting thrown out in the snow and a mug thrown at your head isn’t TOO terrible compared to some of the things Skärva and Derk have been through, but still you can have half a cookie.